“We are excited about expanding with the new Proterra battery electric technology and taking CATbus to the next level with zero-emission, 100 percent battery electric buses,” Moody said. Moody said Greenville-based Proterra is manufacturing the buses, with the agreement of more than $9 million about $3 million less than originally projected due to equipment and construction of the charging stations at CAT headquarters. 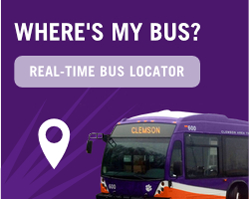 Under the agreement, Clemson has the option to purchase 29 electric buses in addition to the 10 arriving this year. The new bus and the subsequent buses, secured by grant money requiring a local match, are scheduled to arrive between late this month and mid-October. 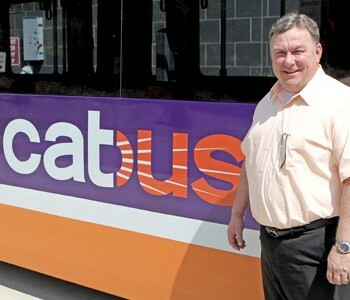 The buses, which are predominantly purple with orange trim, were approved in April by Clemson City Council and also feature the words “Your Battery Electric Cat Bus” in orange and white on their side. But before the new bus and those to follow are put into service, Moody said, they must be inspected by the South Carolina Department of Transportation. Moody said earlier this year that the new electric buses differ from those being used in Seneca due to an extended charge. Whereas Seneca buses can operate for 30 miles on a charge, he said these buses will have a 150-mile charge and will be charged at CAT headquarters due to new charging stations now in place. Moody pointed out that the new electric buses will hold 80 passengers, the same number as the diesel buses still in operation.